John W. Simek is vice president of the digital forensics, information technology and cybersecurity firm Sensei Enterprises. He is a nationally known expert in cybersecurity and digital forensics. John is a Certified Information Systems Security Professional (CISSP) and holds multiple other technical certifications. He is a co-chair of ABA TECHSHOW 2019 and a frequent author (16 books and hundreds of articles) and speaker on technology, cybersecurity and electronic evidence topics. David Ries talks about the need for law firms to develop a quick and logical way to respond to a data breach. Brandon Koeller talks about the Office 365 Secure Score and other best practices to keep you secure in the cloud. Sharon Nelson and John Simek talk about the importance of cyber security awareness and potential training methods firms can use to instruct employees and partners. Is Working with Virtual Assistants Putting your Law Firm in Danger? Tom Lambotte talks about virtual assistances and how involving them could cause data dangers and what lawyers can do to protect themselves. Sharon Nelson and John Simek talk about the most common reasons lawyers run into e-discovery ethics issues, which include social media, Yelp reviews, document manipulation, and “hiding the ball” by giving opposing counsel too much data. Gyi Tsakalakis and Erin Gerstenzang talk about getting reviews, dealing with negative reviews, and creative responses to reviews for lawyers. Judy Selby talks about what cyber insurance covers, the different types of coverage, and why it’s an important part of a legal business. Kaspersky Lab: Friend or Foe? David Ries talks about whether Kaspersky Lab is safe for lawyers to use, diving into where the controversy started and what the results have been so far. This legal technology podcast covers the Equifax breach including who was affected, the resulting lawsuits, and whether or not the hack was preventable. Ben Kusmin talks about the proper handling and format of spreadsheets. Denver Edwards discusses cybersecurity, including the National Institute of Standards and Technology’s (NIST) cybersecurity framework. The CEO of GlobalMac IT discusses how cybercrime has evolved and what Mac using lawyers can do to protect their information. 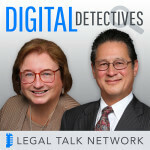 Sharon and John talk to Craig Ball about the intricacies of preserving digital evidence. Guest Charles Patterson talks about TSCM and how this extra level of security can ensure a lawyer's private information stays private. In this episode of Digital Detectives, Sprint's Joe Hamblin joins hosts Sharon Nelson and John Simek to discuss Smishing and other cyber security threats. Executive orders on immigration, veterans initiative, the ABA Blueprint web tool, President Trump’s Supreme Court nominee, and Law Day 2017. In this episode of Digital Detectives, hosts Sharon Nelson and John Simek discuss ransomware with the CEO of LMG Security, Sherri Davidoff. On this Digital Detectives podcast, we discuss governmental cyber security policy under Obama and how policies might change under the Trump administration. Sharon and John sit down with SiteLock President Neill Feather to discuss the importance of website security and data breaches in law firms. Cindy Cohn discusses domestic surveillance, encryption technology, and how lawyers and law firms can protect themselves and their clients from cyber attacks. Sharon Nelson and John Simek speak Jim Calloway about ways small firm and solo attorneys can improve their cyber security. Board certified trial lawyer Craig Ball talks with Sharon and John about information technology competency and the 2016 Georgetown Ediscovery Training Academy. Nuix Chief Technology Officer Stephen Stewart sits down with Sharon Nelson and John Simek to discuss the Panama Papers, the world’s largest data breach. Why are Law Firms Beginning to Form Data Breach Practice Groups? Forensic Science in the Criminal Justice System: What is Admissible?